I have never been as aware of the moon cycles as I am in Salem, where I live blocks from the shore. On low tide days, the full moon pushes out the waters to reveal what lies below the surface. Paths otherwise invisible materialize. One day after exploring the rocky shore of a nearby park, the high water swallowed our return path. My husband and I had to climb onto an abutting lawn where we found the lawn’s owner out on her porch. She graciously allowed us, accidental trespassers, to find the public path via her yard. For a few days each month we can follow the water’s edge uninterrupted. On these days I feel like I’m joining the perennial, ancient dialogue between water and moon, which conspires to connect what was previously disconnected. Humans tend to live in linear time and draw property lines in the sand, but the cycles of nature provide a new lens through which to see. 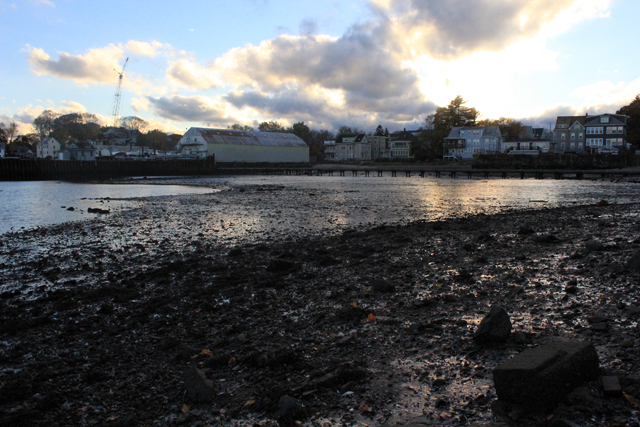 The Salem shore is not pristine. A large storm drain bisects the view ahead. Barnacles cling to its underbelly and marine snails find shelter in the crevices of concrete masonry units. The so-called natural and the man-made are fused. When the water is low, I can see every object rather than just the pieces poking out of a higher tide. Previously disconnected elements are fused together. These unexpected relationships look as messy as life. And so I prefer this landscape to unspoiled nature, just like I prefer not always being able to walk along the shore. Claudia Paraschiv is an architect exploring dialogues between people and places on Massachusetts’ North Shore.